Turn your Android Smartphone into Wi-Fi or Bluetooth Hotspot which helps you to share your Internet with your friends and other devices which are enable with Wi-Fi. FoxFi (WiFi Tether) is an Android Application which help to create Wi-Fi Hotspot and Bluetooth Hotspot. Download FoxFi from Google Play and Install it, turn it on. Now you have to activate Wi-Fi Hotspot on your Android Device. You can also change your Wi-Fi Hotspot Name and can also set password to Wi-Fi Hotspot. Setting Password is necessary by which you can give access to authorized users only otherwise anyone can use your Wi-Fi network. Now you can also use Bluetooth DUN (Dail Up Network) by which you can access Internet on your Computer/Laptop using your Android Smartphone. 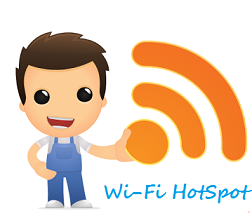 You can access Wi-fi hotspot for any computers, Laptop or tablets or even for gaming console.